It’s not always easy to find the best egg incubator for beginners, but hopefully this won’t be your case. Here we put together a short guide on the things to consider before making a choice, followed by a selection of products that received a lot of praise from previous users. 1 How many chickens do you want? How many chickens do you want? Before getting any hens on your farm, you need to do a little research on their living conditions. However, you’ll first have to decide what breed of chickens you want, as well as their personalities. It goes without saying that if your property is small, it’s pointless to get a hatching device that can hold hundreds of eggs. What you need to also know is that sometimes, not all the eggs in the incubator will turn into chickens. At this point, you’ll have to choose a machine that can hold a few more eggs, just in case some won’t make it to the hatching stage. You really have to take into consideration the space you have for the incubator itself as well. This aspect relates to both height and surface. The dimensions of the machine need to be considered more if you plan on traveling with it, as you’ll have to ensure it will fit in your luggage. Remember that the egg hatcher has to be cleaned while the hatching occurs as well. You’ll have to pay attention to how easy it is to clean while it is in the spot you designate for it. You also can’t ignore that some eggs are bigger than others, and they might not fit into the device, so pay attention to this detail too. The available space should be somewhere inside, as most machines also require a rather constant temperature in the surrounding ambient. Devices made of plastic are the ones that are heavily influenced by how hot or cold it is around them. Some people prefer placing blankets around their incubators to make absolutely sure they’re not disturbed. By doing so, they also lower the amount of electricity these units consume. If you’re a beginner at keeping chickens, or at hatching, you may not know the eggs need to be turned a bit from time to time. An automatic turner in the incubator will definitely save you from having to learn when to turn them and how. You can also be sure the eggs will be turned if you’re not around to do so yourself. To make sure the feature works, you can even mark the eggs. By doing so, you’ll even be able to tell if some are not turning. One reason for which they could not turn is being too large. If you’re searching for an quail incubator, you’re in luck, as most models will be compatible with these small eggs. You’ll generally be able to fit more such eggs in it, than you can chicken eggs. You’ll even find some models in which you can hatch eggs of snakes and other reptiles. No matter which type of eggs you have, as long as they fit inside, you’ll have to ensure the proper temperature for them to properly develop. Various automatic controls and readers are installed on some machine models. Beginners should consider buying incubators with such features, as not to spend more money on separate readers. However there are farmers out there that prefer getting separate such devices for extra security. The temperature readers on some models, display info only in Celsius so pay attention to this aspect if you need Fahrenheit values. Sometimes the device can reset its reader during incubation. This is an issue as the control or reader can’t be set back to the day number it had, and so you’ll have to be even more careful as the eggs have different needs at different stages of incubation. A transparent lid allows you look at the eggs without having to lift the lid. A 7 egg incubator is a popular model with this type of lid. By lifting the cover you lower the temperature inside the device. However, most machines reheat really fast, without having to worry much. Children would especially like to look at the eggs, especially during the hatching time. With a product that turns the eggs automatically you’ll even be able to see them moving, if you have a viewing window. There are models that lack a fan, and you should probably stay away from those ones. The air inside could become too hot or not warm up evenly. Should this happen, you can expect a lower number of eggs hatching. Do choose models that circulate the air inside, to ensure a proper environment for the eggs to develop. Of course these models are a bit more expensive, but you’ll have higher chances of all the eggs to hatch. These models can also overheat, so checking the temperature from time to time will be a good option. How much the incubator costs is another aspect some people base their choice on. Not everyone is willing to pay a fortune on an automatic incubator, no matter what happens to the chickens. Others want the cheapest they can find, even if it means sacrificing the number of hatched eggs. A higher price tag can indicate more features, a larger egg capacity, or even higher quality materials used in the manufacturing process of the item. A lower price usually indicates the absence of those features, and maybe a more frail incubator. The more expensive models might be a better investment for beginner farmers as they’ll have little to worry about during the incubation period. The lack of features and a low cost means everyone can start being a farmer without the risk of losing a lot of money. These cheaper products are also a great learning tool for children, both at home or in school, so they shouldn’t be ignored. Besides requiring your attention more, these incubators are pretty successful in hatching eggs. This article won’t mention the price of the selected products, as this can change and it’s easy to find online anyways. You should however ensure you get a warranty for it or that you can return it, for whatever reason. Now that you learned the most important features of getting an incubator, it’s time we showed you some of the most popular models on the market. Do keep in mind that each of the products has selling and downside points, as none is perfect. The Magicfly Digital incubator fits up to 12 eggs and is made of a PP and ABS combination. 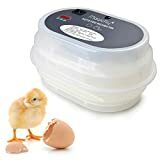 This small egg incubator is suitable for birds such as chickens, geese and ducks, and it includes an automatic egg turner for a more convenient usage. The device has a simple yet effective design and features an automatic thermometer which ensures the ideal environment for egg hatching. Due to its LED display and design, it can also be used by children who want to learn how to incubate eggs. This incubator does not include any feature that shows the egg turner functioning, even when the turner is on. The Magicfly incubator sets its own ideal temperature and does not need any manual adjusting. However, it is recommended to wrap the machine in a blanket or something warm if the house temperature drops below 25 degrees. The package includes an instruction manual as well as a power cable. 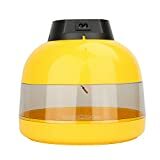 If you need a bigger incubator, check out this Magicfly incubator that fits up to 24 eggs, depending on their size. The incubator features a temperature controller which is set to the ideal environment for hatching, as well as an automatic egg turner which rotates them slowly throughout the day. The device could be the best chicken incubator, as it’s easy to use after reading the instruction manual and does not need adjustments. With a simple design and an LED display, the incubator can be used by children and adults alike. The box features a clear window through which you can watch the incubation process taking place. The unit is easy to clean and contains dividers to separate the eggs for more convenient use. This incubator does not come with an alarm for when the eggs are hatched, so you will need to remove them manually. Users are advised to pay attention to the temperature of the room and keep the eggs warm if it drops below 25 degrees. If you are just starting with hatching eggs, you might benefit from this mini Yosoo hen egg incubator that fits up to 10 eggs. The unit has an LED display as well as a built-in fan and alarm system. The incubator includes a manual egg turner and a transparent window above the eggs which allows you to watch the entire hatching process. After the eggs are placed in the incubator, the temperature must be kept at a steady 38 degrees Celsius, so you might want to wrap the unit in a warm blanket if it drops to avoid disturbances. The device features small ventilation holes through which you can easily insert a thermometer whenever you want to check the temperature or humidity level. The incubator does not come with a humidity setting, however previous users reported to have kept the water dish filled with either tap or distilled water. The package includes instructions, the main unit and a high quality power cord that does not easily disconnect. The GQF 1588 Genesis incubator offers everything you might need for bird hatching. The unit is one of the few automatic incubators for hatching eggs with a TUV listing, which makes it ideal to use not only at home but also in a lab. The incubator comes with its temperature preset to 99.5 degrees F (or 37.5 C) and is easy to use by plugging it in. While the temperature can be adjusted, this is not needed unless the room gets too cold. The incubator features an LED display, an egg divider as well as built in sensors which prevent the eggs from getting burned. Its digital system allows for proper egg hatching even when used by beginners, as the command setting remains unchanged regardless of the humidity changes. While this GFQ is mostly used for bird eggs, it can also be a good choice for reptile hatching due to its temperature functions which can be set at 80 F (26.6 C). Thanks to its large size, the incubator fits up to 50 chicken eggs. The unit package includes an US cord set and plug however it does not come with an egg turner which needs to be bought separately. 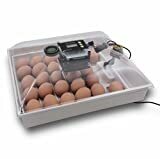 The Homdox digital incubator offers simple functions and can fit up to 7 eggs. 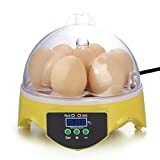 Although the product is not an auto turning egg incubator, it does include an LED display which shows the current temperature as well as controls to manage it. 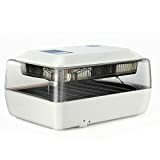 This mini incubator is idea to use by beginners as well as in class, as it features a clear window through which you can observe the hatching process. In order to ensure a successful hatching, make sure to manually turn the eggs 3 times a day and provide about 50 percent humidity for 18 days. The last 3 days require 65 to 75 percent humidity. Some previous customers reported the incubator is too small for 7 eggs and only up to 5 should be hatched at a time. Additionally, the incubator’s temperature might not stay constant, so additional thermometers are recommended. Starting a small farm with a few chickens is really easy with the egg incubator from Life Basis. Their device holds up to 10 chicken eggs. Larger eggs like those of geese and ducks can also be hatched in this device. For geese and ducks, you can fit up to 5 and 8 eggs, respectively. To ensure a proper environment in the machine, the manufacturer installed a temperature controller as well. There is no humidity reader, however it’s easy to maintain it constant by adding half of cup of water, twice per day. The incubator designed by Life Basis also has an egg turner – a feature that is perfect for absolute beginners to artificial egg hatching. If you mark the eggs, you can easily make sure they turn, thanks to the transparent window surrounding them. The machine comes with instructions for how to set it based on the egg types you want to hatch. You should be warned that it comes pre-set to hatching chicken eggs, so you’ll have to change them if you have different kinds. A good incubator should allow you to control the temperature inside, like on this IncuView model created by IncubatorWarehouse. The temperature display can be set for either Fahrenheit or Celsius. There’s also an automatic warmth control and a humidity gauge installed on this machine. Some users used separate readers for warmth and humidity, and the numbers seldom matched. The product can hold up to 27 eggs, but larger than the ones laid by geese. If you want to hatch quail eggs, you can fill the incubator with about 40. The machine is made of plastic, and it has a transparent lid shaped like a dome. Its lid must be removed to add more water, however given its small size, the temperature quickly goes back to the desired level. The product itself has a squared shape and the eggs are arranged in rows of 5, with 2 extra spots. The device comes with an egg turner that works automatically. This specific piece is removable for when it’s not needed, like at the end of the hatching period. 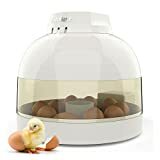 Make sure to also read some of the best egg incubator reviews out there before purchasing, to ensure the unit will do its job regardless of how much it costs or the name written on it.